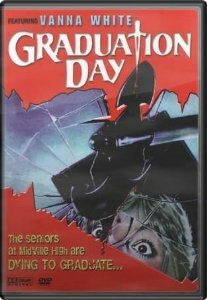 If you hated the jocks back in high school, then 80s slasher Graduation Day is the movie for you, because a killer is taking them all out. 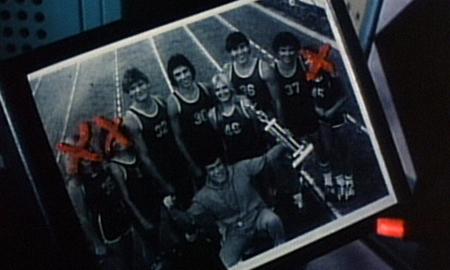 The movie opens with an awful disco song (someone didn’t get the memo that it’s now the 1980s) playing over a slow motion scene of a high school track race. Sadly, someone doesn’t make it to the end of the race. Graduation Day gets a lot of credit for including all the essentials of slashers of the era. There’s plenty of killer POV, effective music cues, numerous death scenes, shots of the killer crossing the faces of victims off a photo of the track team, various red herring suggesting that anyone could be the killer, a final chase scene including loads of body reveals, a good twist at the end, and a unique MO for the killer—after each kill, a gloved hand operates a stopwatch. 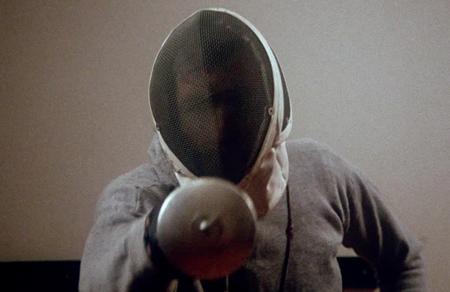 Plus, the killer sort of has a uniform, sometimes donning fencing gear and mask. Overall, this is one of the better slashers that came off the assembly line in the early 80s, but it lacks in two areas. First, most of the kill scenes show the weapon of choice being raised, followed by a scream, and then the aftermath of what was done to the victim. The best real time gore effects include a girl being pierced through the throat with a fencing sword and a head being lobbed off. The bigger issue, however, is the “main girl,” if you could call her that. She’s almost an afterthought. She doesn’t even go to the school, but has come home after the death of her sister—the runner who didn’t make it to the finish line at the beginning. Rather than being a final girl with whom we can connect, she’s one of the suspects, so there’s no signature character to carry us through the film. However, those issues are minor when you consider some of the 80s awesomeness. For as the credits begin, you’ll relish so many of the names coming up on the screen. When a director making an 80s horror movie needed T&A, he’d call on Linnea Quigley. She may be best known for her dance on the tombstone in Return of the Living Dead and the lipstick scene in Night of the Demons, but Graduation Day had her first. Before she began flipping letters, Vanna White had a small role in this film. Christopher George, who appeared in most horror movies with his wife Linda Day (Pieces, Mortuary, Day of the Animals, Cruise Into Terror) goes stag in this one as the coach. Felony, a band that had a minor new wave hit with the song “The Fanatic,” appears in this film in glammed up glory, awash in classic red and blue Dario Argento-style lighting. And Billy Hufsey, who would join the cast of the television series Fame in its third season, plays Linnea’s boyfriend. Best of all? What a waste of a tight end. Billy breaks out the exact moves he would do 3 years later on Fame, dancing as Felony rocks on in the background under the Argento-esque lighting and Linnea watches from the sidelines. Now THAT is a film clip that needs to go into an 80s time capsule. And it would be remiss if I didn’t mention the chauvinist who thinks that any woman who doesn’t want him must be a lesbian. 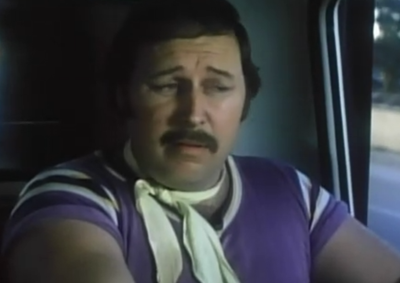 Surely it couldn’t be that the purple shirt, ascot, and gay pornstache are sending them the wrong message…. This entry was posted in Living in the 80s - forever, Movie Times & Television Schedules - Staying Entertained, Sound Check - The Songs Stuck in My Head, The Evil of the Thriller - Everything Horror and tagged 1980s, 80s, Graduation Day, slasher. Bookmark the permalink.